Cambria Berkeley Countertop was born on August 2012 as lemon poppy seed bread. Lemon Poppy Seed Bread carries her popularity by having unique taste and unique look. Cambria Berkeley Countertop’s warm beige tones and dark brown flecks are being very popular in kitchen remodeling ideas same as Lemon Poppy Seed Bread. In Addition, Cambria Berkeley has some golden and red dusty flecks. Comparing her young age, she is humble and pretty even she seems very busy. The warm feeling of this engineered stone is very attractive to many homeowners. Cambria Berkeley Countertop possesses nice calming swirls beside her secret keeper characteristics. In and out kitchens love her dust or crumbs hide out style. Solid color subway tile that complements the colors in Cambria Berkeley Countertop is always safe. Her backsplash ideas are always natural color mosaic or subway travertine or ceramic tiles, but as a novelty natural tone or blue tone glass matchstick backsplashes or blue and green tone mosaic tiles can be chosen. Different material and different set up of backsplashes are ended up with excellent results. Since she has a calming action, she carries diagonal backsplashes and brick set up backsplash very proudly. Cabinets colors that balance out with Cambria Berkeley is almost endless. From white tones to browns, or even grays and navy blues give the best results when Cambria Berkeley is your company. Two tone cabinets dance harmonically with her. The mesmerizing pictures with the inspiring expressions of Cambria Berkeley Countertop are below for your review. Picture Credit: The Guy Corporation., Architectural Group C. Wayne Olander ASID, RID, NCIDQ, Arteffects, Architectural Interiors Inc. and Designer Amy Y. Contreras/Amethyst Interiors. , Cambria Berkeley Countertop and Island top with two tone cabinets and hand made tiles ( Indy Art Forge wall tile). 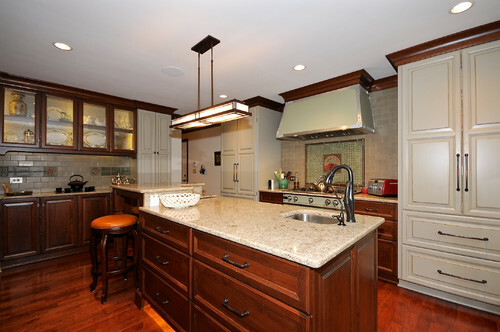 Customized Cherry cabinets with cherry stain and white painted coffee glazed cherry cabinets. Cherry hardwood floor make a cool coordination with countertops. Glass door wall cabinets are complimentary for this craftsman style kitchen. Very sweet taste like lemon poppy seed bread. Picture Credit: J. S. Brown & Co., Doesn’t seem gorgeous? The white maple cabinets with eggshell paint and coffee glazed high lights and mini subway Vine Street Noce tumbled travertine backsplash link arms with Cambria Berkeley Countertop. Stainless Steel Appliance stove and oven and custom made wood went hood are the bonus. Picture Credit: Tricia Thompson Interior Design., Irresistible taste! Very down to earth colors and very good pick of design elements, that are palletized with detail oriented eyes. Designer created the backsplash using 3×6 Torreon Tumbled Travertine, Bedrosians Elume 5/8X5/8 Maple Rum Elume Glass & Blended Mosaic and Torreon Pencil Liners. Indigo color custom made cabinets , Antique Pecan stained Heart Pine flooring with diagonal set up, Cambria Berkeley Countertop and framed backsplash are completed with soft color wall paint (Kelly Moore, Yang Mist). Picture Credit: South West Kitchen and Bath.,Eclectic kitchen design by using Cambria Berkeley Countertop. Light Maple cabinets, diagonal set up travertine backsplash, colorful mosaic inlay, stainless steel appliance and terra cotta flooring are the best choice to connect with live kitchen. Neat and functional. Picture Credit: Cameo Kitchens, Inc. via Houzz., Another good picture of showing the friendly calming affect of Cambria Berkeley. Honey Brook Custom Cherry Cabinets with traditional finish and glass and stone mosaic tiles ( Brixton Piano Tessera) and natural color porcelain flooring (Brown Field Zone ) make an organic bond. Raised breakfast bar on the countertop brackets are very creative idea for transparent look in transitional kitchen design. I am looking forward to seeing your valuable comments and pictures. Thank you for reading my article.